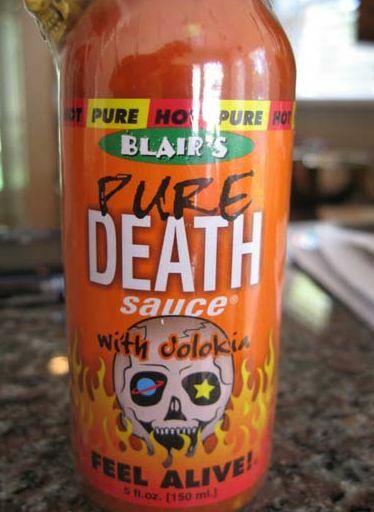 Just a quick announcement here that Blair’s Pure Death is now available on his website www.extremefood.com. SWEET!! I am a huge Blair’s fan, been waiting on this one…. Ah, this must be the Naga sauce he was talking to me about a year ago. Looks tasty! i have a question. If it is the same old Blair that he always mentions in his textbook post, then why doesn’t he ever come to the big shows anymore? On this hot sauce, was wondering tastewise, what you think of his top 3 sauces and does rank amongst them? My fav so far is the Muerte. Thanks Jim! Once again you are a fountain of information. LOL – tell me about it. Madisyn turns 1 on Friday. LOL – that and a helmet! Don’t worry i’m sending her home with you! Hey Jim and All, Yep, You are very correct…… I had my arline ticket in hand, room booked in New Mexico, and plans on meeting many old and new friends In NewMexico……3 hours before my flight my wife told me both my children had fevers, and was under the weather as well, she was telling me its still ok to go and all that stuff, I wanted to go to NM more than you can imagine, To me being asked to sign bottles and take pictures with chiliheads is my real reward but the only thing I put before Hot Sauce is my Family……So in answer to your question, I can promise you I am not the invisible man (Not even close) and if anyone on this blog knows how to become invisible please let know……I have some days that I wish I could be…. (I bet we all do at somepoint) . I have working day and night on so many f-in unreal things that my head is going to explode (I iwill try to get it on tape if it does)……Now,Cuz I am writing this Let me give you an idea of whats goin on…..1.Blair Presents-Zakk Wylde berzerker sauce line (This is going to be huge and bummer for me I cant give more details till the legal eagles from the rock star world let me loose 2.I was contacted and signed by a major TV Production company In December 07 to host my own show for a Major Network We Have already Filmed hours of demo reels and trailers -you will see a trailer in just a couple of days 3. I Also Spent the last 3 months on planning on the opening of a NJ restaurant and working countless hours on it (Only as a partner) The Death Wings were going to be a big part…But Things in the end did not go down the rosy path of life I ihad hoped for (If it does not feel wright there is always a reason) ….But I do wish my almost partner much success with the restuarant 4-100000 Working on Death Spreads, Pure Death, Chipotle Chips, and a bunch more stuff just to name a few …..So again I am honestly sorry I had to cancell attending the Show at the last minute….I do hope to see everyone soon……..My Life has just had a ton of stuff going on ALL at the same(too much, like many of us)…..I wanted to spell it out , As you know about me by now… I like to say it all and keep it very F-in Real…With Much Respect…..Feel Alive Your Chilipal BLAIR. It say 70 users Who is on here? Its funny I have already received 20 emails from my message above sent my email direct, … I never knew how many people look at the blog but dont post on it…..
give me a call sometime pal. As far as the invisibility thing goes, talk to Fat Kid Sauces, he picked up something on Ebay awhile back. No one has seen him since…. Well I haven’t seen hide nor hair of you in forever either, so you must be doing something right. Got your suntan lotion packed or what? Thanks Blair for taking the time to respond. I hope to one day meet your acquaintance. I see your stuff at every rest stop along the NJ Tpke on my way up to NY, so I look foward to see what I scoop up each time I see new stuff. Good luck in your ventures. but i heard becoming pregnant is kinda fun if you’re a lady? 1. Can I have your life or at the very least, just the table scraps of opportunities that you aren’t interested in? 2. How about an autograph?